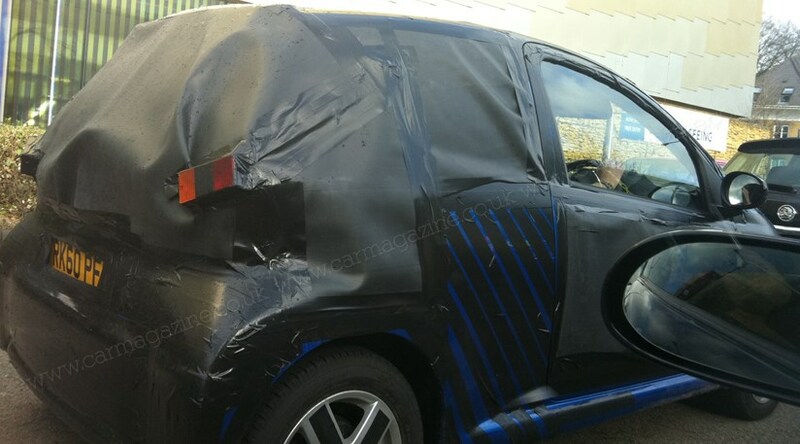 Home Spy Shots Your Spyshots Toyota Mystery city car solved - it's a Toyota Aygo! Mystery city car solved - it's a Toyota Aygo! CAR reader Daniel Puddicombe emailed us these photos of an unidentified city car prototype, spotted by his sister Claire and hubby Peter Mackay in Woking. Turns out it is a disguised Toyota Aygo, pointing to a new version being developed in the UK. But we only arrived at this decision after going round the houses in a game of jigsaw identification. Toyota develops its European cars at its Zaventen R&D centre in Belgium, but this right-hand drive model suggests that a UK supplier is working on the Aygo project. Toyota has close links with Lotus, for instance, and we should remember that Woking isn't a million miles away from Toyota GB's headquarters in Epsom. So it wasn't a Gordon Murray Design prototype? We thought so at first, and checked with GMD, which is based in Woking. They categorically denied it was one of their fledgling minis out on test; Gordon Murray is busy developing his iStream manufacturing process and a range of small petrol, diesel and electric cars similar to the T25 city car concept. 'My sister spotted this in Woking, and I instantly thought of sending it on to you,' said Dan. But he didn't know what it was, either. So we asked you lot, who deluged us with comments and ideas in the comments section below and on Twitter. Don't read too much into the number plate, which identifies this prototype as being registered in the UK locally in the Reading area. Car companies based around there include Honda (Swindon factory) and Mercedes-Benz (Brooklands uber-dealership), but this car doesn't belong to them. Could this have been a Tata city car, as the Indians are developing some of their new cars in the UK? Engineering consultancy Ricardo isn't far away, or could this have been the new junior Vauxhall city car? It's telling this is a right-hand drive test car. However, our investigation found this was indeed the humble Toyota Aygo. Toyota and PSA launched their city car triplets in 2005, so a new model is overdue. So look out for a major facelift and string of revisions coming up soon. >> Secret new city car, or a shed covered in binbags by a car enthusiast with a sense of humour? Let us know what you think!